Here you will find some examples of various thank you card wording. We have compiled a list of thank you card wording below in the event you may need additional help on what to say and place inside your thank you card template. The samples are noted according to the expression of help or service. 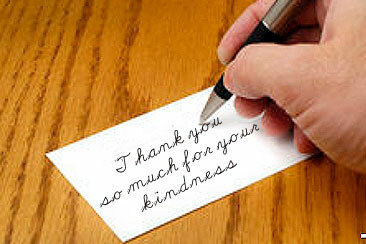 You may also want to review our article for more information on Writing Thank You Cards. We have a large selection of beautiful thank you card templates with matching designs of all our programs and prayer cards. Friends and family volunteer services such as babysitting, transportation, etc. We wish to express our sincere appreciation for all your love and support during our time of loss. Thank you all for acts of kindness to our family. Thank you everyone for the many expressions of kindness, support and love you have shown to us during this period of bereavement for our family. It has been a comforting blessing to each of us. God bless you all for your acts of kindness and expressions of sympathy in our great loss. We sincerely appreciate the token of love you have provided and means so much to our family. The family would like to tale this opportunity to express our sincerest appreciation for the thoughtfulness presented to us and love we have been given during our time of bereavement. May God Bless You! We deeply appreciate your kind expression of sympathy in our time of great sorrow. Thank you for keeping us in your thoughts and prayers. that we saw sitting there.